He is a NFL football coach and former professional football player. He played college football for the Baylor Bears and was drafted by the Chicago Bears in the second round of the 1981 NFL Draft. He was known as “The Heart of the Defense” for the Chicago Bears’ Monsters of the Midway in the mid-1980s. He was inducted into the Pro Football Hall of Fame in 1998. He later pursued a career as a coach. He served as linebacker coach for the Baltimore Ravens and then for the San Francisco 49ers where he was promoted to the head coaching position. Today, he is currently the linebacker coach and an assistant to the head coach for the Minnesota Vikings of the National Football League. Despite his tremendous success on the field, he found that he felt “empty” and unfulfilled. He said, “I had everything. And it was right after the Super Bowl that I realized that I was really, really empty. I had done all this stuff. I had made the Pro Bowl. I just signed a great contract. I was the MVP that year. I had just won the Super Bowl. But I was the emptiest and the most frustrated.” Although he was raised in a Christian home, the lifestyle of sports superstardom had overshadowed his faith, and he had come to a crossroads. He said, “I just remember, one day, breaking down. I remember saying, ‘Lord, I’m supposed to be Your son, and You don’t talk to me or use me. You don’t do anything. I don’t understand this.’ In my spirit, I heard two things. One was ‘I want to use you, but there are some things that you gotta clean up first.’ The second thing that I had to do was forgive my father.” His father had divorced his mother and walked out on the family when he was 12 years old. 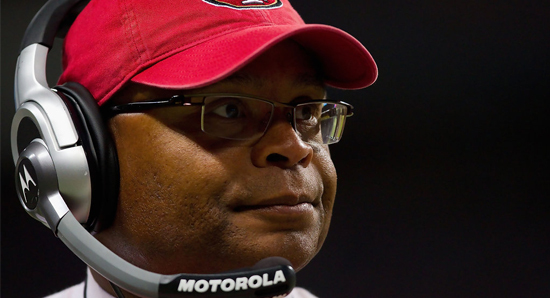 His name is Mike Singletary.